English, Paperback, 15x22.5 cm, 286 pages, b&w phots - From the four corners of the nation, farmboys, truckers, miners, and clerks descended upon the golden coast of California. Carrying their guitars, their notebooks, their very lives strapped across their backs, they were dedicated to creating a new sound mined from the rich veins of American music: rockabilly, country & western, mountain ethnic music, and folk. 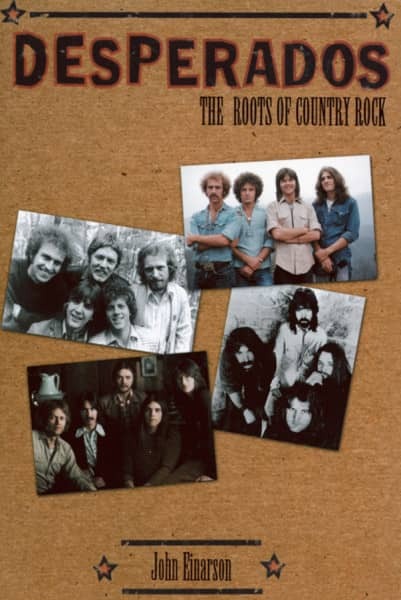 Buck Owens and the Buckaroos, the Dillards, the Flying Burrito Brothers, the Buffalo Springfield, the Nitty Gritty Dirt Band, and Poco all blazed a trail for the band that became country rock's greatest success story: the Eagles. Based on exhaustive interviews with many of the pioneers of country rock, Desperados is the first and only book to chronicle the history of its rise from an unknown form to a genre that spawned the best-selling record of all time, The Eagles' Greates Hits. From wild street brawls betweeen hippies and rednecks, through the corporate dogfights over bands, to the tragic deaths of country rock's founders (Gene Clark, Gram Parson, and Clarence White), this important book incisively and entertainingly documents the developments of a genuine American art form. Customer evaluation for "Desperados - John Einarson: Roots Of Country Rock"